Standard report RFUMSV00 “Advance Return for Tax on Sales/Pur.” (for the purposes of this article also referred to as tax report) can be used for different tax reporting purposes. Apart from purely analytical purposes, it can also be used to generate files in .txt / .xml format for electronic exchange of reports as well as posting tool to calculate amount of tax payable and post it to so called “netting account”. Overview of both scenarios can be found in my previous article “Tax return in SAP”. This is a follow-up article that provides additional information on customizing options behind “posting mode” of this report. I would like to note that the information presented in this article shouldn’t be considered as a best-practice-scenario. This is rather an article that explores pros and cons of the approach. Whether or not it will suit your business requirements, that’s another question. You can also find this blog post on Medium platform under the following link. Business operations relevant to VAT executed during the month resulted in debit balances on “Input tax account” (i.e. VAT credit from business perspective) and credit balances on “Output tax account” (i.e. VAT liability). Let’s suppose these amounts are equal to 6000 and 7200 UAH respectively. SPRO → Financial Accounting (New) → General Ledger Accounting (New) → Periodic Processing → Report → Sales / Purchases Tax Returns → Define Accounts for Automatic Tax Payable Transfer Posting. Once in customizing menu, press “Posting Key” button to configure posting key for transaction “UMS”. Standard setup implies posting keys 40 / 50 for debit / credit posting. These posting keys are limited to GL accounts, therefore you cannot post tax payable to vendor account directly. To enable direct posting to vendor, change the setting by indicated posting keys 21 / 31 for debit / credit to vendor accounts and save your changes. Return to previous menu and indicate vendor code. Returning to program RFUMSV00, initiate posting of tax payable. Please refer to article “Tax return in SAP” for more details regarding specific options of this menu. Run the program. As can be seen from the following screenshot total balance to pay equals 1200 UAH. The result of batch input execution is summarized in the following typical log. Please note that there some drawbacks of this approach. One of them is that the program generates a lot of vendor line items. In this simplified example, it generated one transfer posting per each tax code. Considering that tax reporting and analytics in SAP is usually tax-codes-based, typical implementation for a company especially in countries with complicated tax regimes (Brazil, Russia, Ukraine etc.) might easily involve 50-60 tax codes. Because of these architecture, posting of tax payable directly to vendor account might involve a lot of “extra” vendor line items. Depending on customizing options, posting of tax payable might be executed on more detailed level. This applies for instance to those cases when companies use document splitting functionality from New GL. 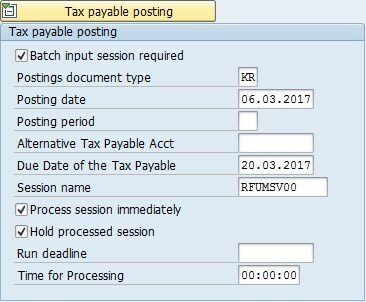 If document splitting based on profit centers is used, posting of tax payable will generate one vendor line item for each unique combination of tax code and profit center. The last aspect to cover in this article is related to processing of tax payable transfer documents from automatic payment program (APP) point of view. Though the net amount to pay in this example (1200 UAH) represents accounts payable position, APP doesn’t know about that. During proposal run only credit line items will be considered as eligible for payments, whereas debit line items will be included into exception list. This issue might be easily solved by a simple workaround – clearing of vendor open items. Go to transaction code F-44, indicate references to vendor code, clearing date etc. and proceed to clearing. I would suggest to opt for clearing with residual item, which will clear two previous line items and generate new document with one open item, which can be easily processed by APP. Another drawback, however, is that it doesn’t inherit baseline date from the source document, but that’s not a big issue. I hope it was an interesting article and you have learn something useful. I’m looking forward to your comments and remarks. All sensitive information used in this example is invented by my own. If there is some coincidence with real-life companies, it is a purely accidental one. This is not an original idea of my own. I’ve stumbled upon it in a post by Paul Ovigele and decided to explore different options behind its usage. Is there a possibility to have different tax accounts? We have 15 different entities in one company code, where we would like to have different accounts. Thanks for feedback! Regards your question, standard SAP functionality implies that GL account for tax payable posting is defined on a client-level which means that it will be the same across all company codes. And in my opinion that’s a good approach to have the same GL accounts determination accross company codes. I’m not really sure, what you mean by “15 different entities per one company code”. What do you consider as an entity in this case? Hi Bohdan, I meant sales organisations by entities. Now all tax posting for all entities (different countries) all go to the same VAT Payable account. For reason of different currency and transparency, we’d like to split them. In case it’s not possible through customizing, I will overrule it in the tax report using an alternative GL account in the Tax Payable Posting section.